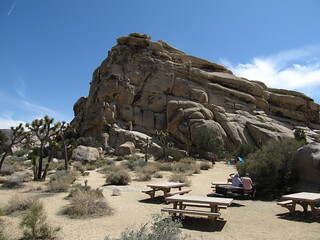 Joshua Tree National Park is located in southeastern California. Declared a U.S. National Park in 1994 when the U.S. Congress passed the California Desert Protection Act (Public Law 103-433), it had previously been a U.S. National Monument since 1936. It is named for the Joshua tree (Yucca brevifolia) forests native to the park. It covers a land area of 789,745 acres (319,598 ha). A large part of the park is designated to wilderness area—some 429,690 acres (173,890 ha). Straddling the San Bernardino County/Riverside County border, the park includes parts of two deserts, each an ecosystem whose characteristics are determined primarily by elevation: the higher Mojave Desert and lower Colorado Desert. The Little San Bernardino Mountains run through the southwest edge of the park. The higher, drier, and slightly cooler Mojave Desert is the special habitat of Yucca brevifolia, the Joshua tree for which the park is named. It occurs in patterns from dense forests to distantly spaced specimens. In addition to Joshua tree forests, the western part of the park includes some of the most interesting geologic displays found in California's deserts. The dominant geologic features of this landscape are hills of bare rock, usually broken up into loose boulders. These hills are popular amongst rock climbing and scrambling enthusiasts. The flatland between these hills is sparsely forested with Joshua trees. Together with the boulder piles and Skull Rock, the trees make the landscape otherworldly.